Residents in the Glenn Heights neighborhood, just along the Ellis and Dallas county border, picked up their garden houses and helped firefighters battle a wildfire that threatened homes in their community Saturday afternoon. Some residents even helped pull fire houses across alleyways for fire crews from more than a dozen departments in North Texas. "I just helped them real quick," said one resident. "They asked for my help." House by house, the hoses came out as flames danced dangerously close to homes. Large wildfires on the border of Ellis and Dallas Counties forced residents from their homes on Saturday. "I couldn't understand it," said Glenn Heights resident, Makei Roberts. "I could actually see the flames behind this house and I'm like what's going on, so we're out here trying to water the yards." As the afternoon went on, fear and concern spread throughout the neighborhood. "My neighbor banged on the door real hard and the rung the door bell and so they told me to get out immediately," said resident, Tammy Warren. "I start praying and I was like, Lord not my house." Just when it seemed fire fighters had the situation under control, in an instant the flames jumped from a field onto a the back side of some homes. "In a matter of probably 15 seconds, those flames were a hundred feet up in the air," said Ellis county resident, Blake Odgers. "Just blew up all of the sudden. It was just instantly burning. We had to take off running." The flames soon consumed the roof of one home as residents scurried through the streets, hoping everyone made it out of the area safely. 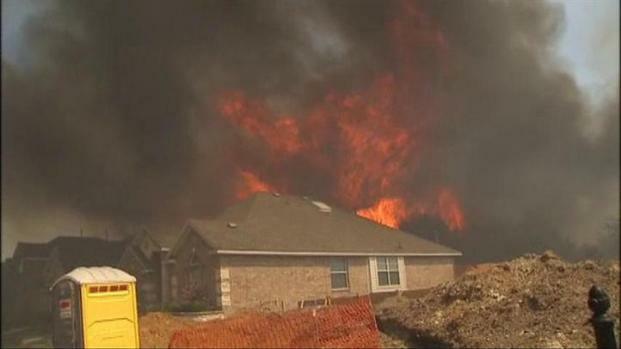 Hundreds of residents evacuated their homes, not knowing what they'd find when they returned. "We have fire and police everywhere," said resident, Rachel Amadour. "They're telling us we gotta go, we gotta get out." At the end of the day, dozens of fences, at least one car and a home could not be saved. The wildfire consumed at least 200 acres of land. By Saturday night about 80% of the residents evacuated from Glenn Heights were able to return to their homes. Two fire fighters were transported to the hospital for heat exhaustion. No others were injured.